In the hills of Onondaga County, between Tully and Otisco, lies a “sweet spot” where Dutch Hill Maple, LLC is currently tapping about 6,200 maples and is expecting to produce 3,000 gallons of pure maple syrup this year. Here is where you will find 2018 New York Farm Bureau’s Young Farmers & Ranchers Achievement Award winners, Nathan (Nate) and Cristy Williams. Dutch Hill Maple began in 1968, with Nate’s dad, Dave, tapping just a handful of trees in his backyard, producing just a bit of syrup each year. Nate said he also remembers how deep the snow would be and he would follow behind his dad. A lot has changed since then, when there were no tubing lines, vacuum pumps or reverse osmosis (RO). 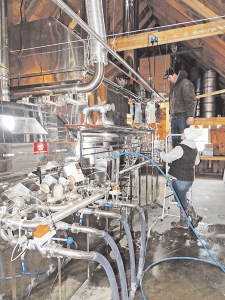 Now, with an updated sugar-house built in 2003 and vacuum system installed in 2004, followed up with the first RO around installed in 2007 and a bigger, improved RO installed in 2018; Dave, Nate and Cristy currently run approximately 3-miles of tree line. Equipment and supplies primarily come from Countryside Hardware in DeRuyter, NY, and Schoolyard Sugarbush in Moravia. Insurance is through Farm Family. “We were awarded the EQIP grant which assisted in the purchase of our new evaporator and RO. Other than that, we’ve paid for everything,” said Cristy. The young couple both graduated in the class of 2006 from Tully High School, but put off continuing education and jumped into working full time. “I found myself working in banking for 10 years — in management the latter part of that — and Nate worked in construction, operating heavy equipment,” Cristy explained. Cristy was never exposed to the maple industry prior to dating Nate and explains that although they attended the same school, she did not really know him until after graduation. They married in 2013, purchasing their own property over the hill from the sugar-house a year later. The new property, of course, included its own good stand of sugarbush. Since then, Dutch Hill Maple has more than doubled their production. Occasional equipment malfunctions and the financial stress of growing a business are all part of the operation. Cristy plays a major role in day-to-day operations at Dutch Hill Maple, which includes developing and maintaining an active website, keeping on top of social media and marketing — while taking care of the couple’s baby. New maple products have been added over the past few years, including bourbon barrel, aged maple syrup. “We aged our maple syrup in a bourbon barrel — from the Woodford Reserve Distillery in Kentucky — for six months. This aging gives our syrup a hint of bourbon taste. You can use it as you would regular maple syrup and it’s great as a finishing glaze on meats or veggies or drizzled on ice cream,” said Cristy. Dutch Hill Maple has also introduced maple sugar pieces, maple cream, granulated maple sugar, maple seasoning and maple cotton candy to their growing list of products. Farmers markets, such as the Syracuse Regional Market, are one outlet utilized in marketing these products. Events, including hosting Maple Weekends and open houses, provide more opportunity to develop new business outlets. Family members, such as Nate’s brother Darren and Cristy’s sister, Colleen help with production when they are able. But most of the business is handled by Nate, Cristy and Dave. Nate and Cristy have received awards for their syrup statewide. 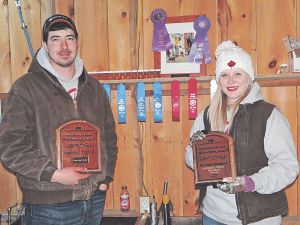 “We are honored to have won the New York State Fair Grand Champion for our syrup the past two years (2017 & 2018) and we are so excited to say that we won New York Farm Bureau’s Young Farmers & Ranchers Achievement Award in 2018!” said Cristy. As American Farm Bureau Federation Young Farmer and Rancher Achievement Award contenders, Cristy and Nate traveled to New Orleans in Jan 2019, to compete nationwide. “It was an amazing opportunity — and we placed in the top 10 of the nation!” Cristy reports. Future plans are in the works. The original sugar-house may be remodeled for use as an Air B&B. “We want to focus on agritourism and give people the opportunity to come learn about maple and experience new things,” Cristy remarked. Currently, Cristy works part-time with the NYS Maple Producers’ Association. Nate serves on their board of directors. The young couple also serves on the board of directors for the Onondaga County Farm Bureau.